While it is true that Medtronic is at an all-time high price, this certainly doesn’t translate to an all-time high valuation. As such, many might be inadvertently passing over perfectly investable opportunities. Everyone is keenly aware the current market situation, right? The broader indices are at all-time highs and thus prices should fall, and partnership decisions made today ought to come with a “caution: danger ahead” label. Perhaps, but we would like to remind the reader that it is not a stock market so much as it is a market of stocks. As a fundamental example of this, we thought it might be interesting to look at the past relationship of share price and earnings for medical device maker Medtronic (MDT). Founded in 1949 by brothers-in-law Earl Bakken and Palmer Hermundslie, Medtronic set out to use their scientific knowledge and entrepreneurial skills to help others. Their first product – a wearable, battery-powered cardiac pacemaker – provided the foundation for the company. Today, as described by the company itself, Medtronic has become the world’s largest medical technology company, offering an unprecedented breath and depth of innovative therapies – fulfilling their mission to alleviate pain, restore health and extend life. Last year the company did business in over 140 countries while more than 9 million people benefited from their therapies. While this provides a bit of insight into how and why the company operates, it doesn’t necessarily give much detail as to the firm’s long-term profitability. Unfortunately, if you were to take a look at most financial websites, you wouldn’t find this information there either. For instance, the below price only graph is what you would likely come across. Here we just see a wiggly black line that doesn’t give you any hint as to the prospects of the business. You can see that today the black line is a bit higher than it has been in the past and might conclude that it is indeed a bad time to buy. Regrettably, this is how a great deal of people think about owning a stock – what has the price done lately? In our view, this is the precise wrong way to look into a partnership decision. Obviously price is important, but it means nothing without simultaneously viewing the business. Unlike a grocery store, $63 doesn’t mean anything in the market of stocks. It could be $6.30, $630 or $63,000 and provide you with the same ownership proposition. Medtronic might be at a “higher” price, but that’s not the important part – valuation is the key. The relationship between price and business performance is what allows for an intelligent study. In order to find the business results, you might look to the company’s financials. 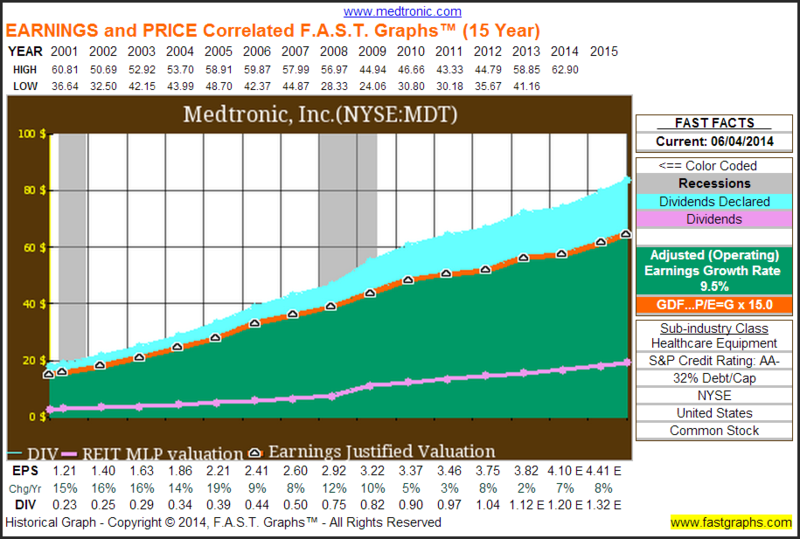 To short-cut this a bit, let’s look at a 15-year graph of Medtronic using F.A.S.T. Graphs™. Here we find that while the price of Medtronic has been wiggly and unpredictable, the business results have been astoundingly consistent. More specifically, operating earnings have grown every year – even during the most recent recession – and the dividend has followed suit. In fact, Medtronic has not only paid but also increased its dividend for 36 consecutive years. If we take these two graphs collectively, even greater insight can be had. At the turn of the century and in the years to follow, investors routinely traded shares of Medtronic at 30 or 40 times earnings – regularly leading to negative or barely positive results. Yet the business wasn’t the problem – it was growing at an average rate of 16% per year. Instead, the valuation was the issue. More recently the exact opposite can be observed. Instead of a continuous premium, investors ordinarily exchanged shares at prices below 15 times earnings – eventually leading to performance results that outpaced growth for the buyers. Today shares trade at about 16 times earnings. But here’s the takeaway: if you were to look at the first graph you would come to the conclusion that shares of Medtronic are trading at a bit higher of a price than they were in the past decade. Yet what that “analysis” doesn’t consider is the idea of improved earnings. 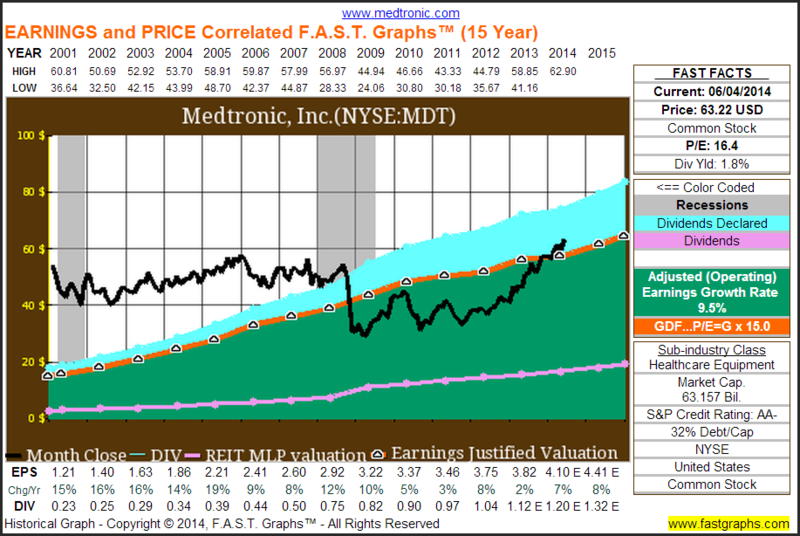 In 2001, Medtronic traded in the $50 range with underlying earnings of about $1.20. Today Medtronic trades around $63 with expected earnings over $4. 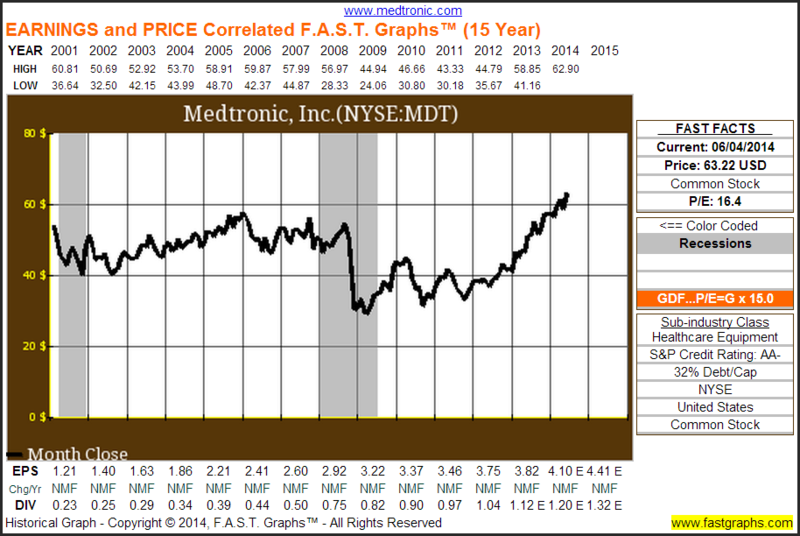 So it is true that Medtronic shares are trading at a higher price – an all-time high in fact. What’s missed in the price only view is the idea that valuation is what matters – obviously you should be willing to pay more for $4 of earnings rather than $1 or $2. In fact, these 52-week and all-time highs aren’t so much notable events as they are common and required occurrences. Moving forward this information can be insightful. Instead of seeing that Medtronic is trading at an all-time high and moving on, you can rationally evaluate a partnership decision based upon its valuation prospects moving forward. 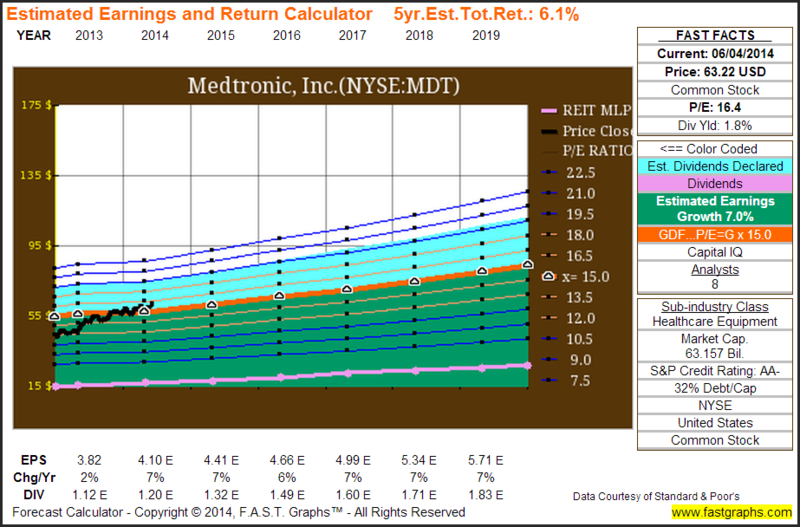 For instance, we have included the Estimated Earnings and Return Calculator for Medtronic below. It uses the consensus estimates among analysts for earnings and dividends and assumes an ending P/E ratio of 15. Here we see a total annual estimated return that is roughly in line with the estimated earnings growth rate. Of course this expected return might not necessarily “knock your socks off” but it does provide a solid baseline of thought. Instead of thinking: “Medtronic is at a new high, I’ll pass.” You can logically consider: “Medtronic has been a great company with an exceptional dividend record. At the current valuation I might expect long-term performance results to roughly track business results over time.” In turn, this type of ideology can help you with your other investment decisions as well. The point is to consider valuation rather than automatically precluding yourself from a rational view of the company due to price only. This entry was posted in FAST Graphs At-A-Glance and tagged MCD, MDT. Bookmark the permalink.